Afroditi Pansion is located in the traditional village of Agios Nikitas in the north-west side of Lefkada, only 12 Km far from the town. Agios Nikitas is built in a hillside full of age-long olive trees. The pedestrian zone of the village leads to a beautiful beach where everyone can have relaxing moments in the sea. During the last years the area has evolved into a famous tourist resort. 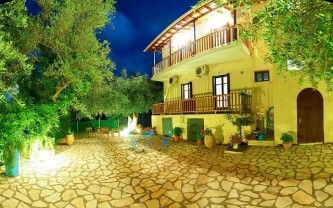 More and more visitors choose Agios Nikitas for their holidays as it combines harmoniously the mountains with the sea.